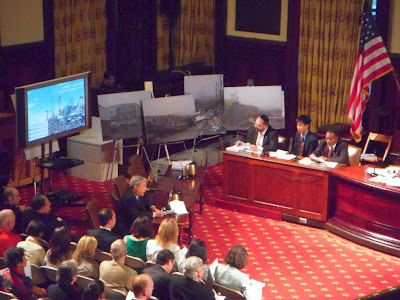 We were at the City Council public hearing today about the city’s proposed rezoning of Coney Island. There is much to tell, not all of it here. We will follow up with another post later. Suffice it to say that the fireworks came at the end of the hearing. It all started with the testimony of a young man named Steven Pong. And it relates to some newly unveiled Bloombergian manipulations with respect to the Coney Island plan. We can also tell you tales about how the hearing was thronged by men and women in construction worker get-up marching in and out, their attendance apparently governed by the clock. That’s for later. Right now, we will just provide you with our Noticing New York testimony. Below is our written testimony. When you include the attachments listed at the end (which you can link to) it was many pages. Our oral testimony was substantially similar except that we did not have time to cover points Nos. 8 and 9 in our allotted two minutes. I offer this testimony as an attorney experienced in real estate, as an urban planner and as former senior government official who worked for more than a quarter of a century in the areas of public finance and development for the state finance authorities. 1. Nobody wants to be blamed for the destruction of the beloved and famous Coney Island yet the city plan, if the City Council adopts it, will accomplish exactly that. Noticing New York opposes the Bloomberg administration’s plan to shrink Coney’s amusement areas virtually out of existence. There are far too many questions without satisfactory answers for this plan be approved. 2. Why do city officials tell us that it must be only this plan, only now, and only this administration? (Even after the extension of term limits!) Why do city officials tell us that they want the public to testify but there is just one option: To testify in favor of the city’s plan? Doesn’t this sound like the melding of two famous offers (Luca Brasi’s Godfather words President Reagan found terrifying): “We are from the government and we are here to help- with an offer you can’t refuse.” The administration’s take-it-or-leave-it offer is, at very best, incompetent. 3. It is counterintuitive that Coney’s amusement area would be saved by shrinking it virtually out of existence. Since shrinking the amusement areas has always been deleterious to Coney in the past, why not now? 4. If saving Coney is urgent, why isn’t the Landmarks Preservation Commission acting to save its landmarks? Why plan to cause icons like famous Nathan’s to be destroyed? 5. Why are we told that Coney Island’s resurrection can’t be accomplished in a natural, gradual, “piecemeal” and organic way, especially if real estate professionals are telling us that Coney’s redevelopment will actually take “generations”? Must the Bloomberg administration always be fatally attracted to megadevelopment that leaves holes in the ground? 6. Why did an administration saying it wants to “save Coney” carelessly spark and let perniciously persist a speculative wave of destruction premised on Coney’s being zoned out of existence? 7. This administration hasn’t made the designation of amusement acres as city parkland work and hasn’t enforced zoning that requires amusement use. Why would such parkland designations and zoning requirements work under this new plan? 8. Who will go all the way to stay overnight in Coney Island when there isn’t even a morning’s worth of amusements to visit. Why expect this generation of hotels to succeed when the last generation were converted to old folks’ homes after amusement acreage was shrunk? 9. Is the city really and truly rezoning Coney Island so that lower-income families will be able to buy “back to school shoes”? And do we believe it when the city says it wants to devote scarce ocean front to low-income housing that it won’t build elsewhere? 10. If the city sincerely believes that it has designated enough acreage for amusement why did public officials confuse the dialogue, making it appear in misleading press releases that the city was providing the 27 acres of open-air amusements the Municipal Art Society has said are the bare minimum needed?